American College of Obstetricians and Gynecologists (2017). “Committee Opinion No. 687: Approaches to Limit Intervention During Labor and Birth.” Obstet Gynecol 129(2): e20-e28. Bonapace, J., Gagne, G. P., Chaillet, N., et al. (2018). No. 355-Physiologic Basis of Pain in Labour and Delivery: An Evidence-Based Approach to its Management. J Obstet Gynaecol Can. Feb;40(2):227-245. Chaillet, N., Belaid, L., Crochetière, C., et al. (2014). Nonpharmacologic approaches for pain management during labor compared with usual care: a meta-analysis. Birth;41:122–37. Derry, S., Straube, S., Moore, R.A., et al. (2012). Intracutaneous or subcutaneous sterile water injection compared with blinded controls for pain management in labour (Review). Cochrane Database of Systematic Reviews 2012, Issue 1. Art. No. : CD009107. Hutton, E., Kasperink, M., Rutten, M., et al. (2009). Sterile water injection for labour pain: a systematic review and meta-analysis of randomised controlled trials. BJOG;116:1158–1166. Martensson, L., Hutton, E. K., Lee, N., et al. (2017). Sterile water injections for childbirth pain: An evidenced based guide to practice. Women Birth. Dec 11. pii: S1871-5192(17)30718-7. Martensson, L., McSwiggin M., and Mercer J. S. (2008). U.S. midwives’ knowledge and use of sterile water injections for labor pain. J Midwifery Womens Health. Mar-Apr;53(2):115-22. Hi, everyone! In this video, we’re going to cover sterile water injections for pain management during labor. Hi, my name is Rebecca Dekker and I’m a nurse with my Ph.D. and the founder of evidencebasedbirth.com. In today’s video, we’re going to continue our pain management series by talking about using sterile water injections for pain relief during labor. It’s estimated that about 30% of people in labor experience intense lower back pain, commonly called back labor. 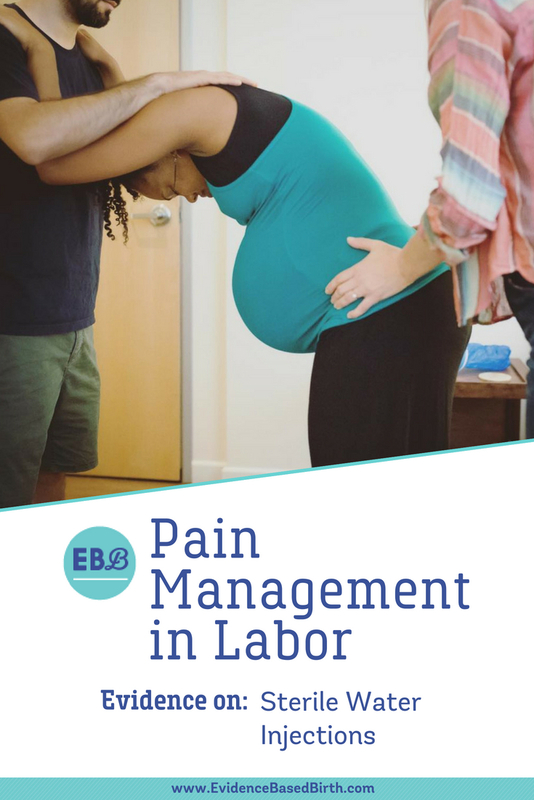 A lot of people think that back labor is associated with the baby being in a posterior or sunny-side up position; however, there’s not a lot of research evidence that really links the baby’s position with where you feel your pain or with back labor. It’s possible that back pain might be related to the baby’s position, but it’s also possible that it might be something called referred pain, which is when you’re experiencing pain in one part of the body, but for some reason, you’re feeling it in another part of the body. Women have described back labor as extreme pressure or intense pain in a specific area of the lower back. Sometimes, the pain even persists during the normally painless rest periods in between contractions. Researchers think that experiencing back labor leads to a higher rate of needing pain medication during labor, such as epidurals. What is a sterile water injection and why might it be helpful? Well, a sterile water injection is thought to be a very cheap, fast way to help relieve someone’s pain and it’s pretty easy for a clinician to administer. For the equipment, you need sterile water, a disposable syringe, and a short needle. If you’ve ever had a TB skin test where they put the needle just under your skin and then push the liquid under the skin to form a little bubble under your skin, this is a similar technique. These injections are given into the person’s lower back. The onset of pain relief is fast, so it works pretty quickly within about two minutes, and the pain management effects can last as long as two hours. Sterile water injections can be given any time during labor; In one research study, they found that some people received injections up to 30 times. How might this method work? Researchers think that sterile water injections work by changing how a person perceives their pain. Sterile water injections work through something called the diffuse noxious inhibitory control method. The idea is that by painfully stimulating the lower back with these sterile injections, it causes the brain to release its own internal supply of morphine, called endorphins. These pain lowering hormones cause the person who’s in labor to perceive their labor pain as less painful. Other coping strategies that use the same method of diffuse noxious inhibitory control include high-intensity TENS, which we cover in a different video, as well as painful massage, high-intensity electroacupuncture, and ice. Sterile water injections were first described in 1885 in an American Medical Journal by a surgeon named Halsted. He wrote, “The skin can be completely anesthetized to any extent by cutaneous injections of water.” In the early 1900s, sterile water injections were used to help with pain relief during minor surgeries and they were also recommended to relieve pain associated with kidney stones. Sterile water injections were first used in obstetrics in the 1970s, and in the 1980s they became increasingly common. Sterile water injections are very popular option in the country of Sweden. They’re available in all maternity care centers in that country, although acupuncture during labor is an even more common pain relief option in Sweden. In the US, sterile water injections are less commonly used during labor. In one 2008 study, they surveyed 132 certified nurse-midwives and found that 26% of the midwives administered sterile water injections, although most of them said that they did it infrequently. What’s the evidence on using sterile water injections for pain relief during labor? We found three systematic reviews on this topic. In 2012, researchers from the Cochrane Collaboration combined seven randomized, double-blind, controlled trials that had 766 participants. These studies took place between the years 1990 and 2009. All of the studies compared injections of 0.5 milliliters that were given in four spots on the back. The intervention group got injections of sterile water and the control (placebo) group got injections of normal saline or saltwater. Normal saline was used as the placebo because those injections are associated with less pain than using pure sterile water. Four studies used something called intracutaneous injections, two used something called subcutaneous injections, and one study used both kinds of injections. Every single one of the included studies found a lowering in pain scores with the sterile water injections compared to the normal saline. However, the researchers were not able to combine the data into something we call a meta-analysis because the studies were too different. The studies all used different ways of assessing pain. Some of them asked the patient how much pain they felt, others asked the physician how much pain they thought the client was in, and many did not report enough of the pain score data for the Cochrane researchers to really determine the quality of these studies. The Cochrane researchers concluded that they were not able to find any good quality evidence that sterile water injections during labor are effective. No adverse or bad side effects were found in the study, other than pain at the injection site which was more common with the sterile water injections than with the normal saline injections. They also looked at other outcomes such as Cesarean rates, forceps and vacuum rates, and Apgar scores of the baby and they did not find any difference between the two groups. In an earlier systematic review and meta-analysis published by Hutton in the year 2009, researchers looked at eight studies that examine the effects of sterile water injections on the Cesarean rate. Six studies compared sterile water injections to a normal saline placebo, one compared sterile water injections to acupuncture, and one study compared sterile water injections to TENS or standard care. The researchers did find a lower rate of Cesareans in the sterile water group compared to the other groups. The Cesarean rate was 4.6% in the sterile water injection group compared to 9.5% in the other groups. The researchers weren’t really sure why sterile water injections cut the Cesarean rate almost in half, but they think maybe it relaxed the pelvic floor muscles and that helped the baby to descend and rotate more easily into the pelvis. Hutton also combined four of the randomized trials into a meta-analysis. Remember, the Cochrane researchers didn’t do this because they felt the studies were too different, but in this study, they disagreed and they did combine four of the studies to become a meta-analysis, which is a larger study. They did find a significant lowering of pain scores at all of the time points that they looked at after the injection. At 10 to 30 minutes, 45 to 60 minutes, and 90 to a 120 minutes after the sterile water injections, the pain scores were lower in the sterile water injection groups compared to the other group. Finally, in 2017, researchers did another systematic review of all of the studies on sterile water injections up to that time point. They found 31 studies and narrowed them down to the 12 highest quality randomized, controlled trials. The goal of this review was to establish evidence-based guidelines for clinicians who are administering the injections. For example, when they looked at the best ways to administer the injection, one study found that giving someone nitrous oxide gas (laughing gas) during the injections help to ease the pain of the procedure. One qualitative study where they interviewed women about their experience found that women actually prefer to be given the injections during a contraction. They also found that the procedure can go faster if two care providers are giving the injection simultaneously, so that you can get those four injections done in half the time. Finally, they found that researchers in Sweden are currently studying the possibility of using a topical anesthetic cream to see if it reduces the pain of the injection but doesn’t reduce the pain-relieving effects of the injection. So, that research is currently ongoing. They also tried to figure out if it’s better to give a subcutaneous injection or an intracutaneous injection. Those techniques are slightly different. The intracutaneous injection makes that little bubble under your skin while the subcutaneous injection does not. They did not find any clear differences in the effectiveness of these two techniques; however, they did find that there has been research on healthy, non-pregnant volunteers which found that subcutaneous injections are less painful to receive and provide similar pain relief as the intradermal injections (or intracutaneous injections) that make the bubble. And they found that the injections are also easier to administer subcutaneously. So, there is some research from non-pregnant people that the subcutaneous injections might provide similar levels of pain control, but they’re not as painful to receive. Finally, they also looked at the number of injections. The researchers found that most studies that found effective pain relief used four injections on the lower back, so that is the number of injections that is currently recommended based on the evidence. It seems that sterile water injections do offer benefits for helping relieve pain, although the procedure itself may be uncomfortable; however, there are evidence-based ways to lower the discomfort of the procedure. In some countries around the world, sterile water injections are a commonly accepted way of helping someone manage their pain, while in other parts of the world it’s not used as often. The bottom line seems to be that evidence does support the use of sterile water injections for helping manage pain during labor, especially back labor. Thanks, everyone. I’d love to encourage you to hit subscribe, subscribe to our YouTube videos, and also to check out all of our pain management series videos. We also have a series all about natural labor induction techniques. Thanks, everyone, bye! To learn more and subscribe to our newsletters for useful information, please visit, evidencebasedbirth.com.